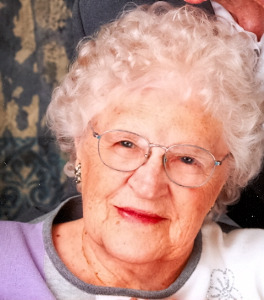 Wanda Verbal Isenhower, 97, died peacefully while surrounded by her family, at the Louisburg Care Center, Louisburg, Kansas, on Sunday, April 18, 2010. Funeral services will be on Tuesday, April 20, at 11:00 AM at the First Baptist Church, Louisburg, Kansas, burial to follow in the Louisburg Cemetery. Visitation will precede the service from 9:00 – 11:00 AM, Tuesday at the church. Verbal was born on October 22, 1912, in Salem, Arkansas. She married Vern Isenhower on January 26, 1929, and they recently celebrated their 81st wedding anniversary. They moved to Louisburg in 1944 and raised 5 children. She enjoyed being a farm wife, mother and grandmother, and loved the wide-open spaces of Kansas. Her many grandchildren, great grandchildren and great, great grandchildren were the light of her life. She was a member of the First Baptist Church of Louisburg. She is preceded in death by her parents, John and Florence Peterson, son Herb, infant daughter Joyce, granddaughter Cindy Picek, son-in-law Richard Picek, brother Gene Peterson, sisters Elsie Faust, Velma Smith, Bernice Whitcomb, Pauline Ward and Lucille Polston She is survived by her husband of 81 years, Vern Isenhower, her son Bill Isenhower (Marlene), daughter Shirley Picek, daughter Sue Knecht (Vince), daughter Betty Zeigler (Dennis), 9 grandchildren, 16 great grandchildren and 8 great, great grandchildren. In lieu of flowers, memorial contributions may be made to the First Baptist Church, 406 South Vine Street, Louisburg, KS 66053, or St. Luke’s Hospice Foundation, 4225 Baltimore, Kansas City, MO 64111. The family extends their heartfelt thanks for the wonderful support provided by the staff of St. Luke’s Hospice. Yes, please send me periodic updates from Penwell-Gabel Funeral Home. Add your memories to the guest book of Wanda Verbal Isenhower. I'm so sorry for your loss. My prayers and thoughts are with you during this sad time.